Since we’re always in the mood here at eFulfillment Service to offer retailers some helpful online selling tips, we thought it’d be nice to cover an informative article that was recently featured on EcommerceBytes. The article, titled, Google AdWords and Beyond: Getting the Most for Your Online Ad Dollars, highlights an interview with Wpromote’s Mike Mothner and offers advice on how online sellers can get more out of their advertising without paying more. The article touches on common advertising mistakes made by both new and established merchants, covers ways to be more targeted and efficient with pay-per-click (PPC) ad campaigns, outlines how Bing and Yahoo can be nice supplements to Google AdWords, and also how social media can and should play a role in a merchant’s advertising. Mothner covered a lot, but one of the things not mentioned in the article was the use of modified broad match keywords. So we wanted to dive into that a bit, as it can be a great thing for online sellers making use of PPC advertising. In the EcommerceBytes article, Mothner touches on the use of keyword match types, including broad, phrase, exact and negative match. These match types basically determine when Google and other search engines will serve your pay-per-click ads, and Mothner offers some great tips on how to ensure you don’t over-expose your advertisements by overusing broad match keywords. While Mothner rightly points out that broad match can often lead to a lot of irrelevant ad exposure, many online sellers may find success using broad match modifiers when advertising with Google AdWords. You can think of modified broad match as sort of a hybrid of broad and phrase match….it’s not as broad as broad match, and not as specific as phrase match. The diagram below does a good job highlighting the differences between match types. The main benefit of modified broad match is that it gives online retailers a nice combination of flexibility and control. To make use of broad match modifiers, advertisers simply need to put a plus sign (+) in front of words that must appear in the user’s search in order to have their ads appear. For example, let’s say you sell running shoes and your PPC account is broken out by different brands. You have an ad campaign for Adidas shoes, and within that campaign, you have ad groups for different models, including adiSTAR, adiZero and Supernova. With this type of account structure, you would have the ability to capture a lot of relevant traffic with just a few modified broad match keywords. 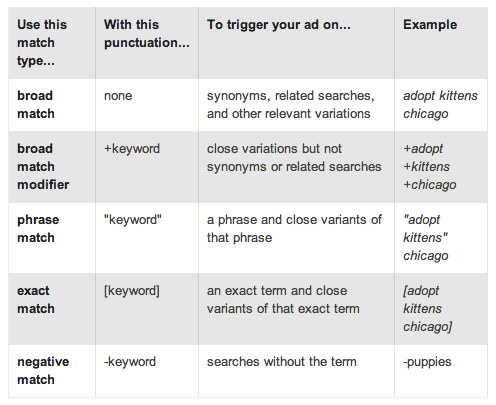 The chart below shows examples of searches that would cause your ads to be served with just one modified broad match keyword. The key to successful utilization of modified broad match is account structure. It is important to have an account and campaigns that are broken out to a large degree so that you’re able to maintain good relevancy with your ads, and to make sure your ads aren’t triggered for irrelevant searches. In the example above, I may even go further by having an ad group for certain models of adiZero shoes, such as “Feather” and “Sonic.” That way, a modified broad match keyword could be “+adidas +adizero +feather,” and not only would you get traffic on many relevant variations, you could still be highly relevant with your ad copy by mentioning those models in your ads, which would help to maintain good quality scores and ad rank. With modified broad match, it’s also important to keep an eye on actual search queries and add negative keywords when appropriate. And generally speaking, I tend to recommend modified broad match with more specific keywords. So for example, I would recommend using broad match modifiers for specific models of specific brands of shoes, as we did above, as opposed to using it for something as generic as +runnning +shoes. Some may argue that modified broad match still gives Google or Bing too much control over your ad exposure. But as you can see from the one example above, there are many, many different ways that people could search for Adidas adiZero shoes, including by model, color, size, price, etc. And the same holds true for other types of products. As with any PPC tactic, it requires testing, but when used properly with a well-defined account structure, modified broad match is a great way to get in front of the right buyers without adding hundreds or thousands of keywords to your campaigns.